About a year ago, I had the opportunity to be a part of a travel-related award win (albeit, indirectly). I just found out that Outlook Traveller Getaways’ latest book 'Driving Holidays Across India' has just won the National Tourism Award for ‘Best Travel Publication in English’. 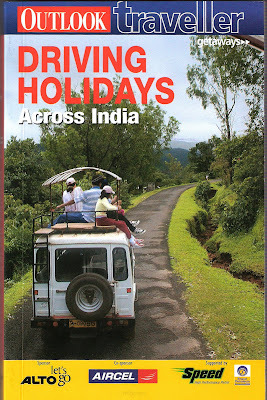 In 2008, my fairly eventful life took a much desired turn when my all-the-time-travelling friend Rishad asked me to replace him and write an article for the ‘Driving Holidays…’ book. I instantly found a liking to him, such a sweet, kind guy, no? So anyway, I went on my first ever road trip from Mumbai-Goa and back to Mumbai. Needless to say, drama ensued and it changed my perception of what true travel is all about. Then, another road trip followed—Mumbai-Delhi-Mumbai. And voila, I became a part of this award-winning book. On a more sentimental note, I’m truly grateful to Rishad for recommending me to the Outlook team. It changed a lot for me and my career. And I feel privileged to be a part of an award-winning book. Life has been good. congratulations. This is a blog to look out for. =) cheers.